WASHINGTON — President Donald Trump predicted great things for his new chief of staff, Ret. Gen. John Kelly, who was sworn in Monday as he looks to bring order to a chaotic White House and rack up a few wins for the president. "General Kelly will do a spectacular job," Trump told reporters in the Oval Office as Kelly sat beside him. Later, during a meeting of his Cabinet, Trump said the retired Marine general "will go down, in terms of the position of chief of staff, one of the great ever." Kelly is tasked with bringing order to a chaotic and leaky West Wing and re-energizing the administration's flagging agenda in Congress. Those issues had been the responsibility of since-departed Chief of Staff Reince Priebus, whose fate was long considered tied to the success — and, in the end, failure — of White House efforts in the GOP-controlled Congress to repeal and possibly replace Obamacare. Trump, in tweets Monday morning, insisted there was no "chaos" in his White House, despite weeks of staff shakeups, legislative setbacks, an abrupt reversal on allowing transgender military service members, tensions with his attorney general, Jeff Sessions, and a spate of very public infighting. 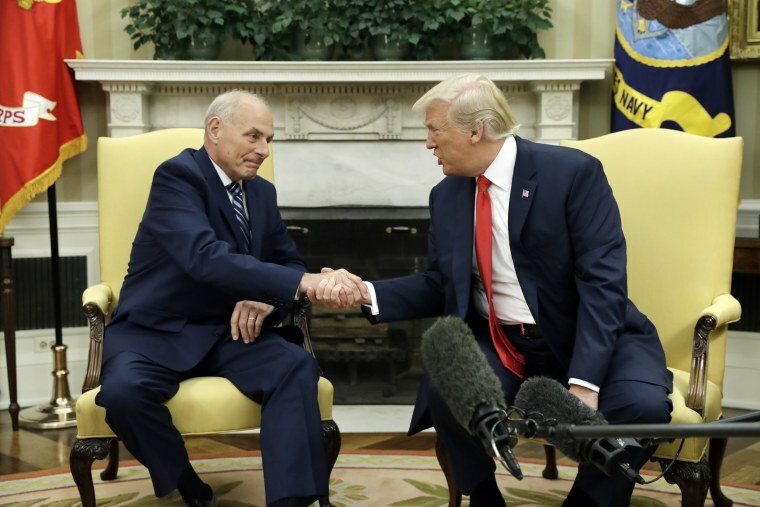 Kelly, a retired four-star Marine general who served over 40 years in the military, enters a White House known for its competing factions and the diluted power Kelly’s predecessor wielded in the chief of staff position. Not to mention a boss who is known for listening mostly to himself. Unlike Anthony Scaramucci, who was brought in as communications director just over a week ago, Kelly does not have deep ties to the president — he was not involved in the campaign — or those who have long been in Trump's orbit. Instead, he's won favor in Trump’s eyes by carrying out his hardline immigration agenda as secretary of the Department of Homeland Security, including the implementation of the legally disputed "travel ban." "What he’s done in terms of Homeland Security is record-shattering," the president said Monday in the Oval Office, bragging about results at the border in reducing the number of illegal crossings from Mexico and the "controversial situation" Kelly handled as head of DHS, presumably a reference to the bungled implementation of Trump’s travel ban. "The country’s optimistic, and I think the general will just add to it, but the country is doing very well," Trump said, citing a strong stock market and business confidence. While Priebus dealt with competing voices in the president's ear — both in and out of the White House — former George W. Bush Chief of Staff Andy Card told MSNBC on Monday that a central piece of Kelly's role will be "discipline." "General Kelly, I think, will bring discipline," Card said, adding, "The president has to allow that discipline to take place if he wants to hold the chief of staff accountable." Before announcing Kelly’s new role on Friday, Trump praised him during a speech to law enforcement officers in New York as "one of our stars." The language was similar to how Trump described had Priebus less than a year earlier, touting the former RNC chairman as a "star" the night he won the 2016 presidential election.